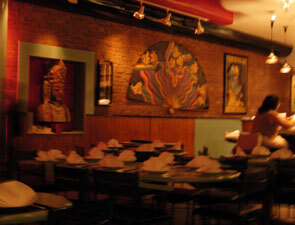 Chinois on Main is a fun French-Asian fusion restaurant with a happening atmosphere. It's not the type of place you'll go for a quiet intimate dinner for two, but if you're looking for lively, fun surroundings, this is a great choice. If you'd like to know a little more about what to expect, and about how to navigate the restaurant in order to get the ultimate dining experience, please read on. Reservations are strongly recommended and can be made online at OpenTable by clicking the "Make a Reservation" button above, or by calling the restaurant directly. The tables for two are around 23 inches wide and about 30 inches deep. There's plenty of room, therefore, but not for a tremendous amount of plates. The seating was about 16 inches at its widest point—fine, but not meant for long-term lingering. No music plays, but the place fills up by around 7 p.m., when the atmosphere gets lively. The casual Asian-themed bistro has reddish hues throughout and lighting is more romantic than stark. The restrooms at Chinois are easily accessible in the back of the restaurant, behind the open kitchen. The dress code is sportswear/casual. Jackets and ties are not required for men. There is valet parking, for a $5 service fee, and parking on the street, if you can find it; if you need a cab, the restaurant will call one for you. Wolfgang Puck has won many awards, including the James Beard Award for Outstanding Chef of the Year, twice.